CoreLogic® (NYSE: CLGX), a leading global property information, analytics and data-enabled solutions provider, today released its June 2016 National Foreclosure Report which shows the foreclosure inventory declined by 25.9 percent and completed foreclosures declined by 4.9 percent compared with June 2015. 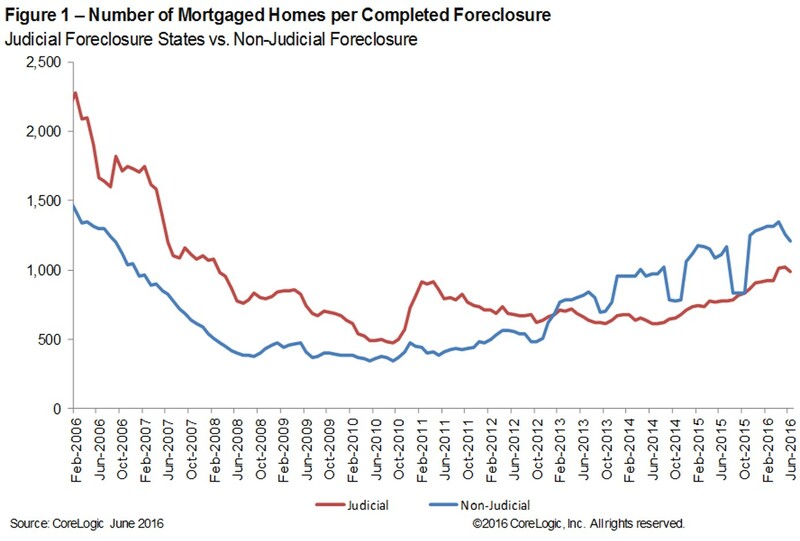 The number of completed foreclosures nationwide decreased year over year from 40,000 in June 2015 to 38,000 in June 2016, representing a decrease of 67.5 percent from the peak of 117,835 in September 2010. The foreclosure inventory represents the number of homes at some stage of the foreclosure process and completed foreclosures reflect the total number of homes lost to foreclosure. Since the financial crisis began in September 2008, there have been approximately 6.3 million completed foreclosures nationally, and since homeownership rates peaked in the second quarter of 2004, there have been approximately 8.4 million homes lost to foreclosure. 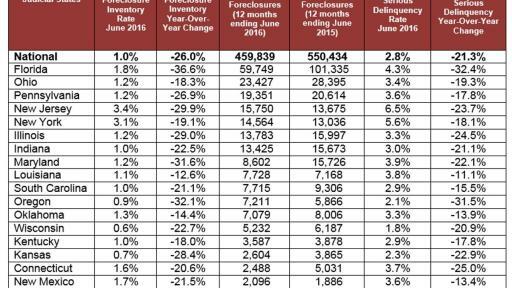 As of June 2016, the national foreclosure inventory included approximately 375,000, or 1.0 percent, of all homes with a mortgage compared with 507,000 homes, or 1.3 percent, in June 2015. 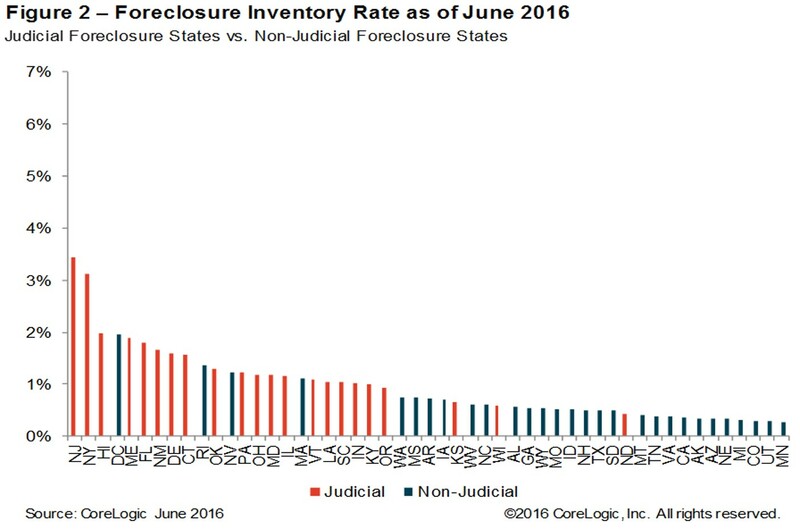 The June 2016 foreclosure inventory rate is the lowest for any month since August 2007. 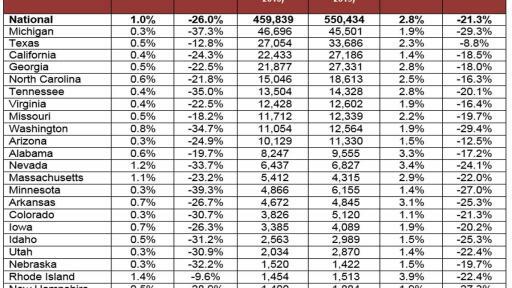 CoreLogic also reports that the number of mortgages in serious delinquency (defined as 90 days or more past due including loans in foreclosure or REO) declined by 21.3 percent from June 2015 to June 2016, with 1.1 million mortgages, or 2.8 percent, in this category. The June 2016 serious delinquency rate is the lowest in nearly nine years, since September 2007. On a month-over-month basis, completed foreclosures increased by 5.1 percent to 38,000 in June 2016 from the 36,000 reported for May 2016. 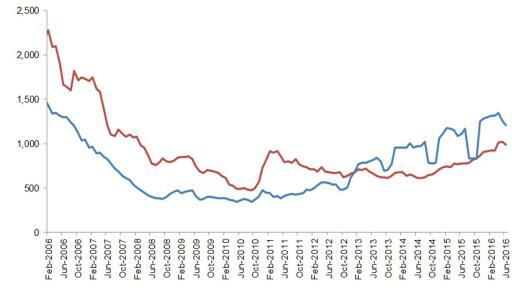 * As a basis of comparison, before the decline in the housing market in 2007, completed foreclosures averaged 21,000 per month nationwide between 2000 and 2006. 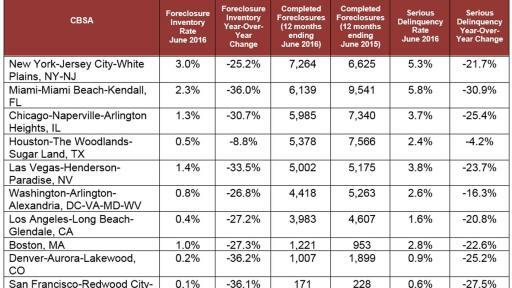 On a month-over-month basis, the foreclosure inventory was down 3.6 percent compared with May 2016. 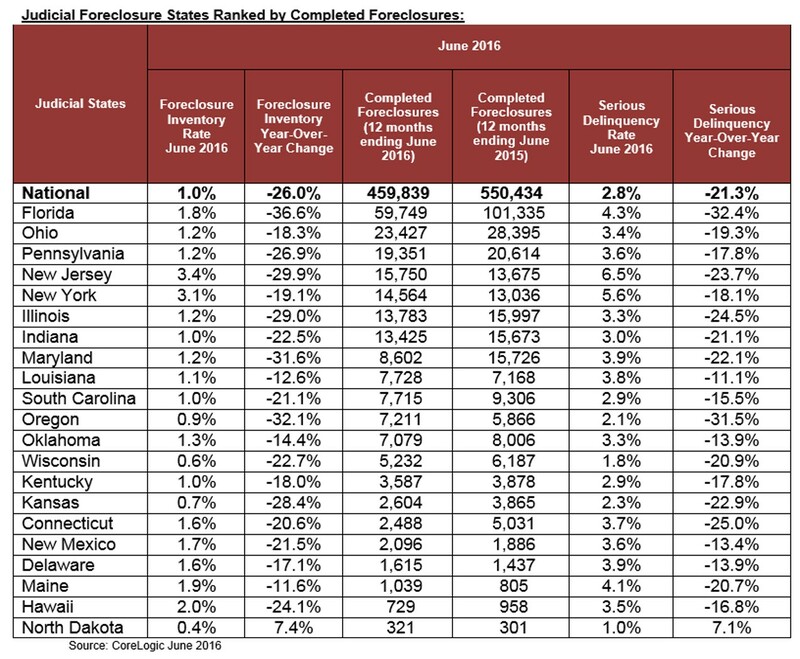 The five states with the highest number of completed foreclosures in the 12 months ending in June 2016 were Florida (60,000), Michigan (47,000), Texas (27,000), Ohio (23,000) and California (22,000). 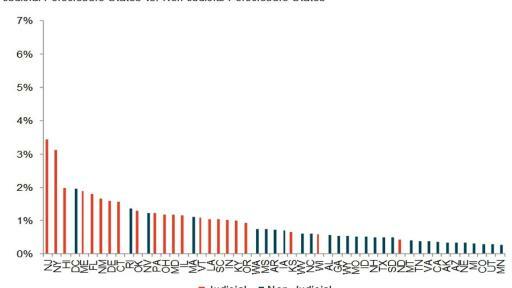 These five states account for almost 40 percent of all completed foreclosures nationally. 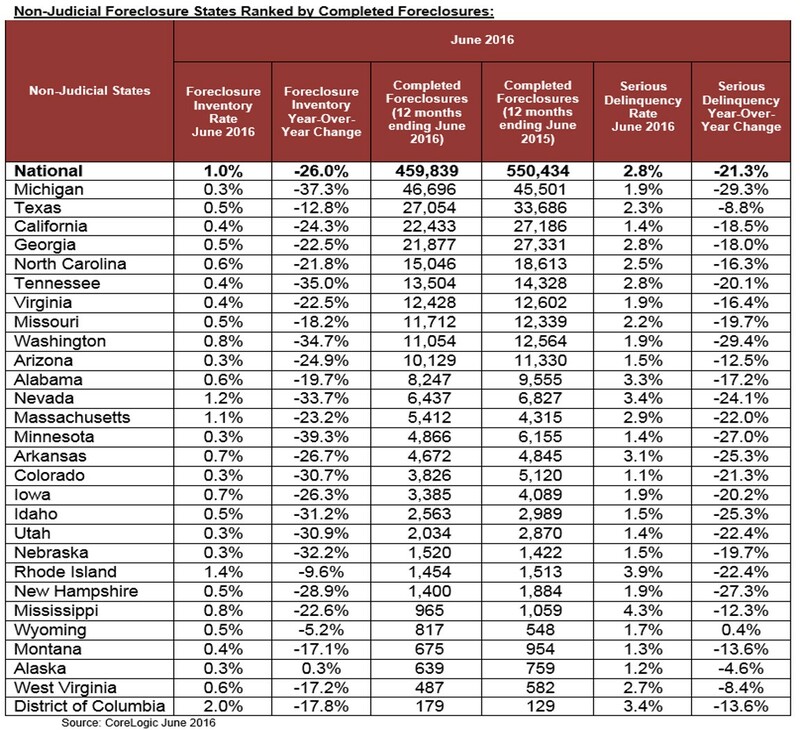 Four states and the District of Columbia had the lowest number of completed foreclosures: The District of Columbia (179), North Dakota (321), West Virginia (487), Alaska (639) and Montana (675). 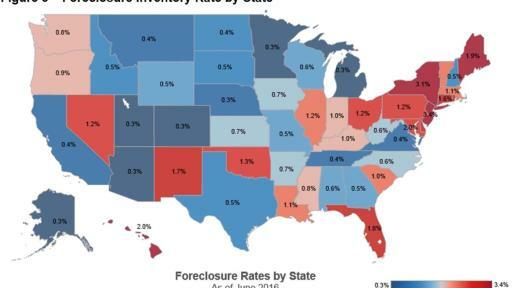 Four states and the District of Columbia had the highest foreclosure inventory rate: New Jersey (3.4 percent), New York (3.1 percent), the District of Columbia (2 percent), Hawaii (2 percent) and Maine (1.9 percent). 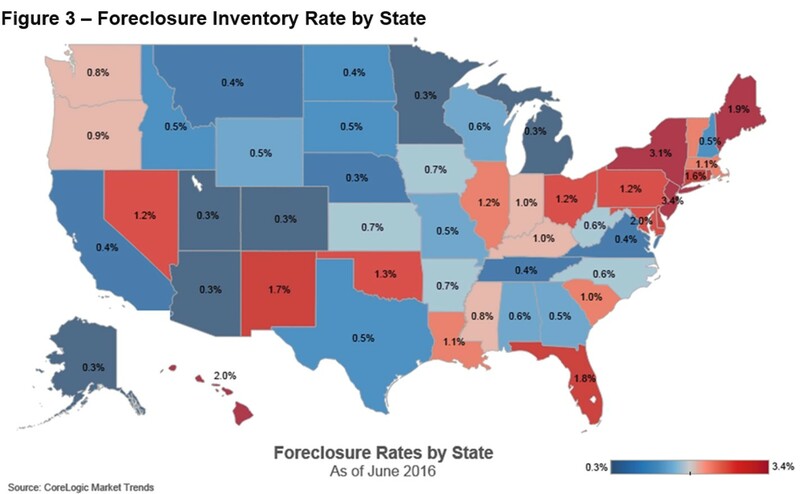 The five states with the lowest foreclosure inventory rate were Colorado (0.3 percent), Michigan (0.3 percent), Minnesota (0.3 percent), Nebraska (0.3 percent) and Utah (0.3 percent). *May 2016 data was revised. Revisions are standard, and to ensure accuracy CoreLogic incorporates newly released data to provide updated results. 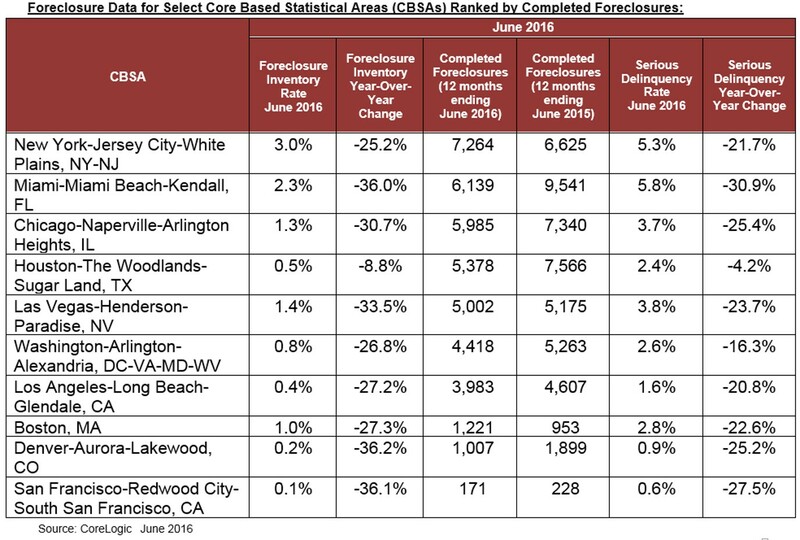 The data in this report represents foreclosure activity reported through June 2016. The data provided is for use only by the primary recipient or the primary recipient’s publication or broadcast. This data may not be re-sold, republished or licensed to any other source, including publications and sources owned by the primary recipient's parent company without prior written permission from CoreLogic. Any CoreLogic data used for publication or broadcast, in whole or in part, must be sourced as coming from CoreLogic, a data and analytics company. For use with broadcast or web content, the citation must directly accompany first reference of the data. If the data is illustrated with maps, charts, graphs or other visual elements, the CoreLogic logo must be included on screen or web site. For questions, analysis or interpretation of the data contact Lori Guyton at lguyton@cvic.com or Bill Campbell at bill@campbelllewis.com. Data provided may not be modified without the prior written permission of CoreLogic. Do not use the data in any unlawful manner. This data is compiled from public records, contributory databases and proprietary analytics, and its accuracy depends upon these sources.